Sunday December 26th 1897 I was busy all morning with the work. Will & Mary Woolf with Frank Woolf and little boy from Delavan were here for dinner later in the afternoon. Ed Mc-- come up. Spent the evening reading. weather still pleasant. Monday December 27th 1897 I have had a pain in my neck for a couple of days so did not wash this morning. Will took me up to see Carrie in the afternoon. I knit all the evening. 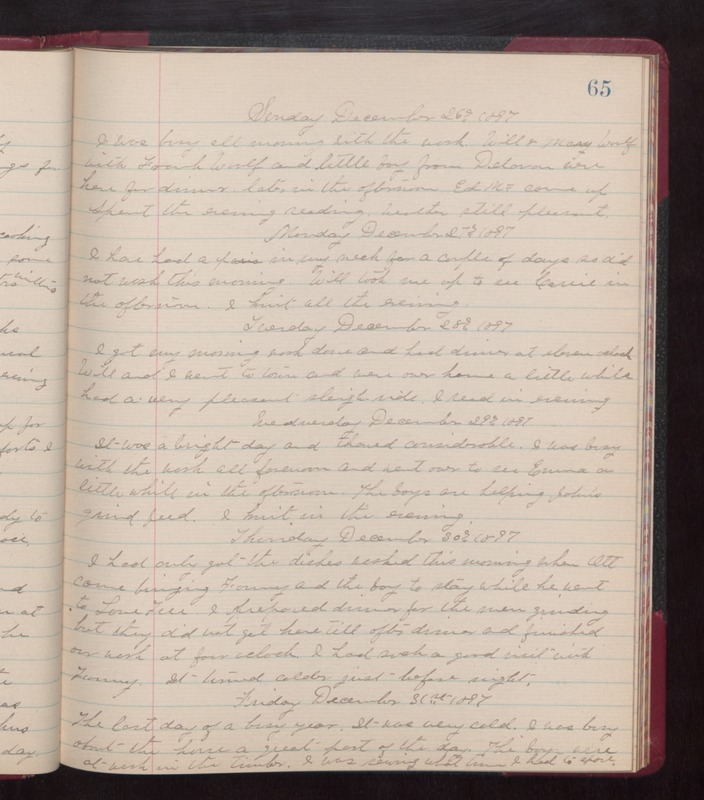 Tuesday December 28th 1897 I got my morning work done and had dinner at eleven oclock. Will and I went to town and were over home a little while. Had a very pleasant sleigh ride. I read in evening. Wednesday December 29th 1897 It was a bright day and thawed considerable. I was busy with the wash all forenoon and went over to see Emma a little while in the afternoon. The boys are helping John to grind feed. I knit in the evening. Thursday December 30th 1897 I had only got the dishes washed this morning when Ott come bringing Fanny and the boy to stay while he went to Lone Tree. I prepared dinner for the men grinding but they did not get here till after dinner and finished our work at four oclock. I had such a good visit with Fanny. It turned colder just before night. Friday December 31st 1897 The last day of the a busy year. It was very cold. I was busy about the house a great part of the day. The boys were at work in the timber. I was busy sewing what time I had to spare.